View of Lowdore Waterfall in Cumbria, Northern England. 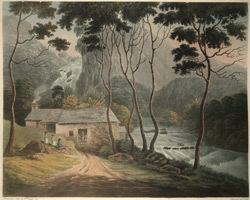 The Reverand John D. D. Robinson in his book ‘Views of the Lakes…’, published in 1833, wrote the following lines about the waterfall, “When it rains the scene is truly magnificent. The tremendous roar of the rushing waters, which is said to be distinctly heard, in a serene evening, at the distance of ten or twelve miles, is perfectly in union with its rocky accompaniments. The distance of the waterfall is not less than one hundred and fifty feet and after a heavy rain, in a full torrent, it exhibits a scene of grandeur of which no verbal description can give an adequate idea”.